Praise for "A West Virginia Rebel" from seriousreading.com 'A West Virginia Rebel' is definitely a must-read for readers who always want to explore new horizons in the history genre. Matthew A. Perry has thoroughly investigated all the events that took place in Jenkins's life and penned down a book perfectly draped in the backdrop of West Virginia. 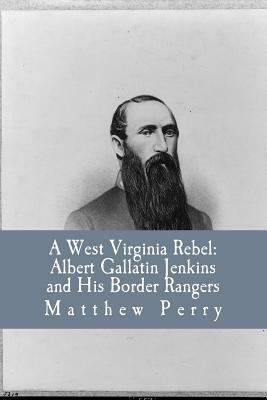 Matthew A. Perry's attempt to recreate history is surely worth reading for everyone who wants to know the ins and outs of Albert Jenkins' life and the history of West Virginia, alongside the sectional conflict of the American civil war." Albert Gallatin Jenkins was a wealthy lawyer and farmer living in the Western Counties of Virginia prior to the Civil War. After the war began, Jenkins would form a Ranger command and conduct many raids in the area that would become West Virginia. Jenkins would fight at Gettysburg and would eventually die for his cause. Against the backdrop of West Virginia statehood and the sectional strife of the Civil War, this book investigates one man's decision to fight against his own neighbors and eventually give the last full measure for his cause. Matthew A. Perry is a native of the tiny town of Ceredo, West Virginia. He is a middle school history teacher at Ceredo-Kenova Middle School and coaches girls basketball at the school. He is passionate about teaching kids history. He has just written his first book about his hometown's history as an abolitionist town during the antebellum years and the fighting regiment that was stationed there. He is married to the love of his life and has three fantastic children.